This article is about the Grays Peak that is the apex of the Front Range of Colorado. For other uses, see Gray Peak (disambiguation). High point of the Continental Divide in North America and the high point of both Clear Creek and Summit counties, Colorado, U.S.
Grays Peak is the tenth-highest summit of the Rocky Mountains of North America and the U.S. state of Colorado. The prominent 14,278-foot (4352 m) fourteener is the highest summit of the Front Range and the highest point on the Continental Divide in North America. (There are higher summits, such as Mount Elbert, which are near, but not on, the Divide.) Grays Peak is located in Arapahoe National Forest, 3.9 miles (6.2 km) southeast by east (bearing 122°) of Loveland Pass on the Continental Divide between Clear Creek and Summit counties. The peak is the highest point in both counties. Grays Peak is one of 53 fourteeners (mountains of over 14,000 feet (4,300 m) in elevation) in Colorado. Botanist Charles C. Parry made the first recorded ascent of the summit in 1861 and named the peak in honor of his botanist colleague Asa Gray. Gray did not see (and climb) the peak until 1872, eleven years later. Grays Peak is commonly mentioned in conjunction with adjacent Torreys Peak. Like the other fourteeners nearby, Grays Peak is considered to be an easy hike by fourteener standards, and is very popular among weekend climbers. 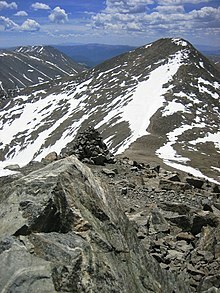 Often a climb to the summit of Grays Peak is accompanied by continuing on to Torreys Peak, less than a mile away. The main trail, Grays Peak Trail, departs from Stevens Gulch. To get to the Stevens Gulch Trailhead, take I-70 west from Denver about 50 miles (80 km) to Bakerville Road, exit 221. From there, take Stevens Gulch Road south about 2.5 miles (4.0 km) to the trailhead. As of the summer of 2009, Steven's Gulch Road is still open for traffic, but is no longer maintained. With cuts in the road over two feet deep and large stones in the path, travel to the trailhead is only feasible for high-clearance four-wheel-drive vehicles, motorcycles or all-terrain vehicles. From the trailhead, it is a hike of about 3.5 miles (5.6 km) and a climb of 3,040 feet (930 m). The trail, well-marked and well-trodden, begins by following the gulch for a slow rise in elevation, before hitting the steeper slopes. The summit includes a very small U-shaped rock shelter where a log book is maintained. Extensive views stretch south to Pike's Peak and the San Luis Valley, east to the Great Plains, West to Silverthorne, and north to Longs Peak and Rocky Mountain National Park. At the climber's option, the trail continues from the summit north to Torreys Peak. The trail descends the saddle down to 13,707 ft (4,178 m) before climbing back to the summit of Torreys Peak at 14,274 ft (4,351 m). Wildlife in the area includes, mountain goat, pika, cougar or mountain lion, mule deer, elk, marmot, coyote, ptarmigan, American red squirrel, and gray jay or Canada jay. Wildflowers that bloom in the tundra area on the Continental Divide of the Americas include moss campion (Silene acaulis), alpine forget-me-not (Myosotis alpestris), sky pilot (Polemonium viscosum), sea pink, old-man-of-the-mountain (Rydbergia grandiflora), and mountain gentian (Gentiana). Below the tree-line, the blooms of monkshood or wolfsbane, blue columbine, fireweed, and paintbrush (Castilleja) can be found. ^ a b c "GRAYS PEAK". NGS data sheet. U.S. National Geodetic Survey. Retrieved January 2, 2016. ^ a b c d e "Grays Peak, Colorado". Peakbagger.com. Retrieved May 25, 2018. ^ a b "Grays Peak". Geographic Names Information System. United States Geological Survey. Retrieved November 14, 2014. ^ The elevation of Grays Peak includes an adjustment of +1.881 m (+6.17 ft) from NGVD 29 to NAVD 88. ^ Gannett, Henry (1905). The Origin of Certain Place Names in the United States. 258 (2 ed.). Washington, DC: United States Geological Survey. pp. 142, 302. This page was last edited on 9 August 2018, at 08:20 (UTC).